Readers of The Sign Depot blog know that our expert sign-makers are able to assist with sign design, but did you know we work many others in the design industry as well? One of those designer partnerships we have formed is with Bradshaw Design. Bradshaw Design is the firm responsible for our well-designed and very functional website. They understand our esthetic, and in turn they came to us to build a cedar wood sign project for a client. When I first noticed the structure pictured above, I immediately thought of the wooden toy blocks that I had a child. When I looked closer at the item and read the text, it does show that they are using the concept of building a harmonious project by concentrating on each step (or block) that will get you there. This is how we think of our sign projects as well. We focus on the details to ensure that it will make the designed sign come together flawlessly. We consider everything from size, style, material, font, text and colour when it comes to creating signage. We believe it is difference between meeting our clients’ expectations and exceeding them. Exceeding expectations is something we pride ourselves on. Everything we produce is a reflection of our clients’ professionalism as well as a reflection on The Sign Depot. In this case, the sign structure we created for one of Bradshaw Design’s client impressed them so much that they sent a testimonial to them and included our craftsmanship in their note. We received the original ‘Carleton House’ yesterday and the entire Compass team absolutely loved it! Please pass our sincere thanks and congratulations to your wood working partner as he created a truly beautifully designed ‘Carleton House.’ I love the cedar wood he used throughout. 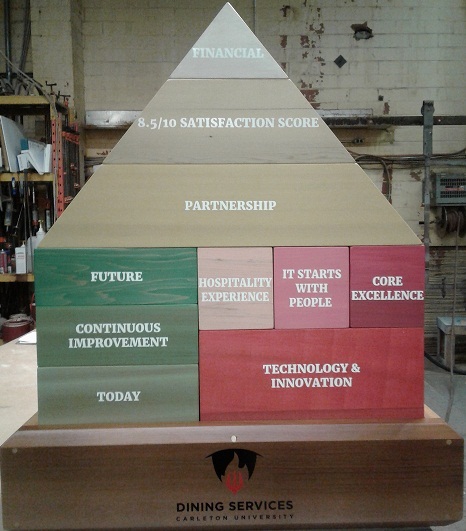 The base truly looks like an award podium with each additional block so intricately designed and created. I know that took a significant amount of talent! Well done to you both!!! In our last blog post we spoke about finding the right fit for your business. Once you have found the signage concept that works for you, then your next step (or building block) is to find a sign company that can bring your design from the computer screen to a 3 dimensional object. We would appreciate the opportunity to discuss your next sign project with our signage team. Just visit our CONTACT US page to get the process started. We want to help you build your business with our custom signs.